E A Rsoft Metal Detectable earplugs were specially developed for food processing and other industries where it is critical to keep earplugs from contaminating products and processes. 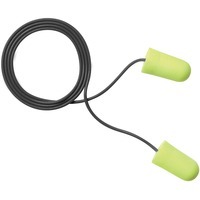 Recognized by most metal sensing systems, these earplugs feature an implanted, stainless steel ball bearing in the plug and metal particles in the cord. Regular size fits most ear canals. Poly bag keeps each pair of earplugs clean before use. Noise Reduction Rating NRR is 32 decibels. CSA Class AL. Earplugs are test compatible with 3M E A Rfit Validation System. Tapered roll down foam is made of polyurethane.